There have been many reports about the safety both of aluminum and Teflon dangers. If you're concerned about your exposure to aluminum but still want to cook on nonstick surfaces, hard anodized aluminum cookware may be a better option in your kitchen. This cookware can tolerate a higher temperature and will probably maintain its nonstick surface longer if cared for properly. Anodized aluminum is aluminum that has been chemically treated and electronically charged to produce its own coat of rust protection. The anodizing process also makes the aluminum harder or less flexible. Hard anodized cookware is aluminum that has been subjected to a higher voltage and cooler chemical bath, resulting in an even harder surface. As depicted in this video, aluminum blanks, or raw circles of aluminum, are formed in hydraulic presses to the correct depth. Once the aluminum is pressed, the pan shape is trimmed to round and polished inside and out to achieve a smooth surface. It should be noted that aluminum is porous prior to anodization, so color can easily be added after forming. Stamping and punching (such as the manufacturer's label and the holes for handles) happen after polishing when the metal pan shape is baked to start the hardening process. The aluminum form is then treated to a chemical bath to stabilize the color and further harden the basic pan shape. The nonstick coating is then sprayed inside the pan and baked on to stabilize the surface. Finally, stainless steel handles are riveted or screwed on to finish the product. Anodizing is a hardening process that reduces the amount of aluminum that will leach into your food. A nonstick surface, properly applied and cared for, will also protect you from any aluminum leaching into your food. The greatest risks to nonstick aluminum cookware are exposure to scratches and wide changes in heat tolerances. You can protect your nonstick cookware by not stacking it, not running it through the dishwasher where it may get banged against metal objects, and by letting it cool before washing it. Hard anodized cookware is just as lightweight as regular nonstick and ceramic cookware, but has a higher heat tolerance and is less likely to flex, another terrible risk to the nonstick coating. Aluminum is a terrific conductor of heat, but if you run water over a hot pan, the aluminum will flex, putting the coating at risk. Hard-anodized cookware is less likely to flex, but your cookware will still last much longer if you let it cool before you wash it. Stainless steel is non-reactive; aluminum is not. However, stainless steel is not a great conductor of heat. Many stainless steel pans are built in multiple layers or clad; this means aluminum is sandwiched between layers of steel to reduce weight, conduct heat and protect you from food that's been exposed to aluminum. The All-Clad set offers cooks of all stripes plenty of options. This set features two frying pans, two saucepans, a 4 quart saute pan and an 8-quart stockpot. You can use this set on any cooktop, including induction. This set is oven safe to 500 degrees Fahrenheit / 260 degrees Celsius and dishwasher safe. The lids are glass trimmed in stainless for stability, and the saute pan features a helping handle across from the long working handle, very useful when pulling these pans from a hot oven. 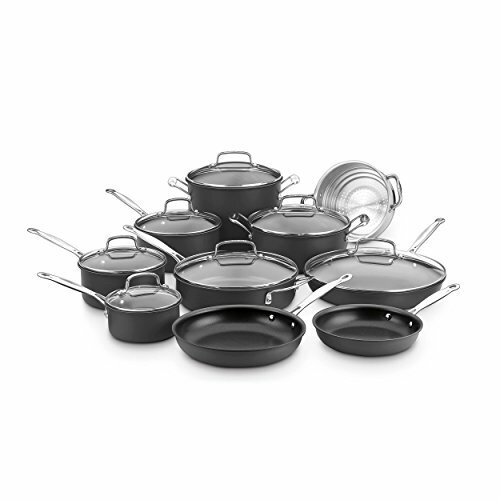 The Circulon Acclaim 13-piece set features three saucepans, three skillets, a saute pan and a stockpot. There are five lids included which offer coverage to every size of pan. The Circulon cookware construction style features raised circles inside the pan for easy food release. This construction, paired with PFOA (Perfluorooctanoic acid) free nonstick coating means you can greatly reduce the amount of oil needed to prevent sticking. You can likely increase the heat of your favorite stovetop dishes for a browned finish with little risk of sticking. It should be noted that the Circulon Acclaim cookware set has a limited temperature tolerance thanks to the comfort grip rubberized handles; they can't take more than 400 degrees Fahrenheit / 204 degrees Celsius. Additionally, the lid handles have a design feature that may make them rather difficult to handle. While they allow plenty of clearance to protect your fingers from the glass, these handles are quite narrow at the attachment point and flare out. If you have large hands, the stock pot and saucepan lids may be awkward to remove safely. If you're looking for a basic nonstick set to start with, this is an excellent choice. This set features a 6-quart stock pot, two saucepans, and two skillets. The stock pot lid will fit the smaller skillet. The lids are tempered glass framed in stainless steel and have vent holes, so you can easily monitor your foods and prevent boil-over disasters. Pieces from this set will move easily from cooktop to oven; they're tolerant up to 500 degrees Fahrenheit / 260 degrees Celsius. 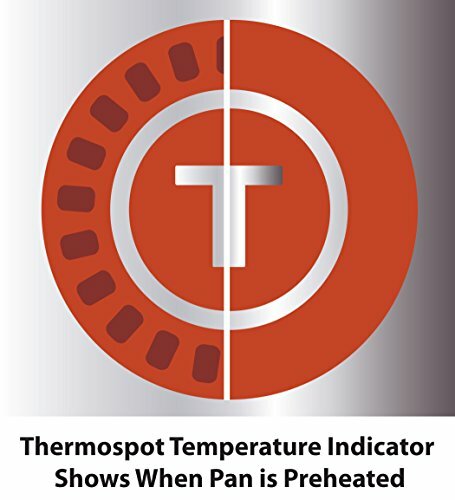 If the lid is on the pot, the top oven temperature tolerance is 350 degrees Fahrenheit / 177 degrees Celsius. For aluminum cookware, these pans are quite heavy, but if properly cared for they should last. Unfortunately, they will not work on an induction cooktop. They are dishwasher safe, but hand-washing is recommended. The rounded handles on the lids and the stock pot are quite tall and allow plenty of space for your fingers. Take care around the vent holes; if you've never had vent holes in your lids before, it can be a nasty shock to get too close to the escaping steam! The 17-piece T-Fal set is loaded with enough components to outfit your kitchen completely. 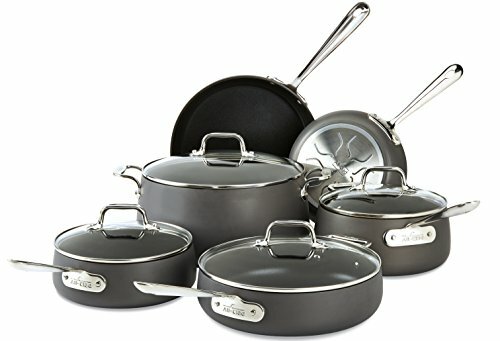 This cookware collection includes two frying pans, an 11.5-inch frying pan with lid, a square griddle pan, three saucepans, a Dutch oven with lid and steamer insert, and a small one egg wonder pan. All pans have soft silicone grip handles with holes for easy hanging storage. Lids are tempered glass with vent holes and stainless steel rims. The handles on the lids are high and flared with a soft rubber grip and plenty of grasping space. 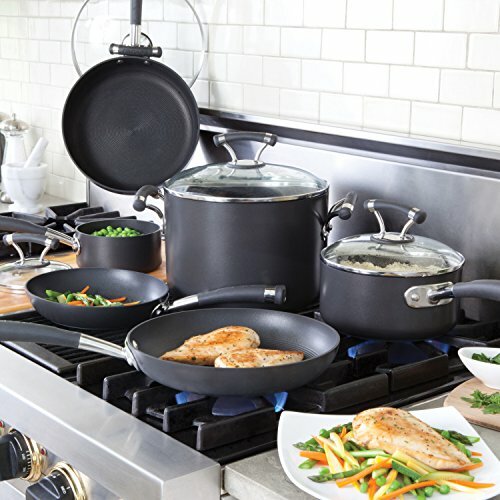 Teflon cookware uses a modern nonstick coating which is made with safer, more durable surface coatings, greatly reducing anodized cookware dangers. SEE ALSO: Is Silicone Safe? Also, the set features a temperature indicator at the bottom of every nonstick so that you'll know when the pan is hot and ready to use. The T-fal E765SH cookware set is oven-safe to 400 degrees Fahrenheit / 204 degrees Celsius. The lids are safe to 350 degrees Fahrenheit / 177 degrees Celsius. As with many nonstick pans, these are rated as safe in the dishwasher. However, it should be noted that things can get banged around in the dishwasher. 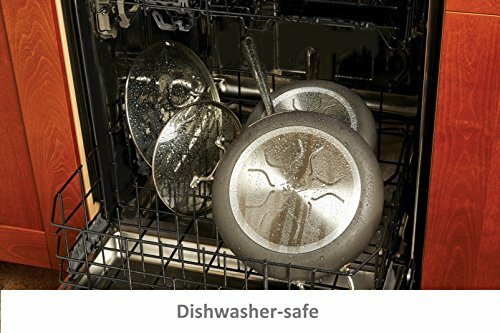 See our best dishwasher reviews for the latest technology to clean and protect your pots and pans. However, one of the best things you can do to protect your nonstick pans is to let them cool and wash them by hand. 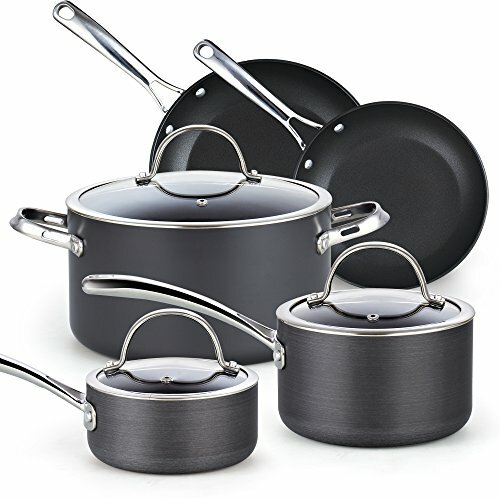 Not only does the Cuisinart 17 piece cookware set feature hard anodized pans, glass lids, and stainless steel handles, but the nonstick coating on these pans is reinforced with titanium for durability. The Cuisinart set offers users plenty of options when preparing meals; this set includes three saucepans, three frying pans, an 8-quart stockpot with a steamer insert, and a 3.5 quart saute pan with helper handle and cover. When considering hard anodized cookware safety, the use of a helper handle should be taken into consideration. Many dishes could use a bit of seasoning in the oven before serving, and a helper handle can save you from burns and mess. There are no soft grips included with this set. These pans can be moved from the cooktop to an oven temp of 500 degrees Fahrenheit / 260 degrees Celsius. It should also be noted that these pans are heavier than many hard anodized aluminum pieces. 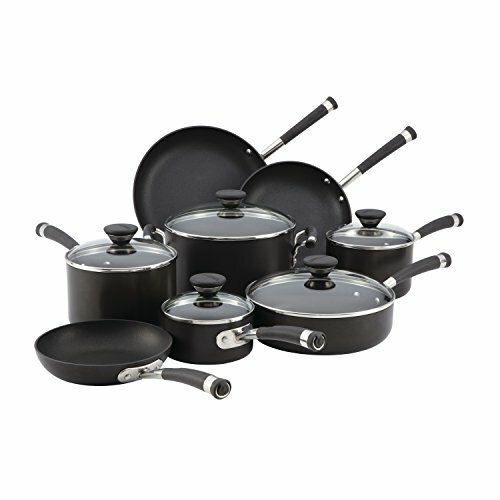 In fact, when comparing it to the T-Fal 17 piece set, this set is 8 pounds heavier to ship. For heavy-duty cooks with many to feed, this may be a bonus. However, if you struggle with limited movement in your hands or wrists, this cookware may be too hearty for your use. Do not put Cuisinart 66-17N cookware in the dishwasher; some users found the nonstick flaked off and clogged the dishwasher drain. If you are trying to reduce the fat in your diet, a nonstick cookware set may be a great investment because they allow you to to back off the butter and oil in some of your favorite recipes. 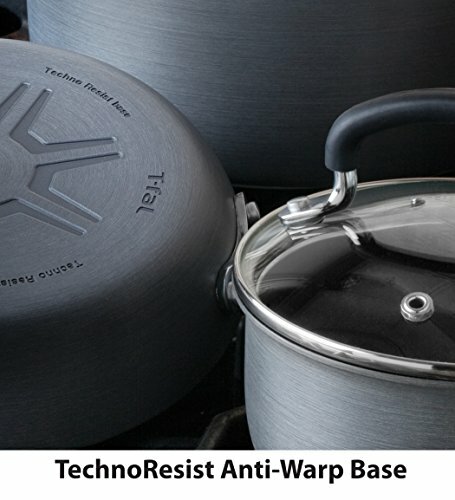 Nonstick cookware technology has improved tremendously since Teflon cookware first hit the market. New hard anodized aluminum cookware is sturdier and better constructed than ever before. If we had to choose just one set from our reviews, the 17 piece T-fal E765SH Ultimate cookware set would be the one to replace our old pots and pans. After you've eaten, check to make sure the pan is cool before you wash it with warm, soapy water. If possible, hang your nonstick cookware to reduce the risk of anything striking the nonstick surface. Treat them gently so as not to cause the aluminum body to flex, don't use harsh or metal cooking or cleaning tools against the nonstick surface, and have fun with your cookware!